About a few days after making reservation at Torrisi, news broke that the restaurant would close on January 1st and re-open as a 15-seat fine dining restaurant with a brand new name — lucky timing eh? Not that Torrisi’s eighteen-seat joint is any easier to get into than this 15-seat place will be but, whatever. The most vegetarian unfriendly establishment I’ve ever encountered (which sort of sadistically pleases me — veggies be gone!) 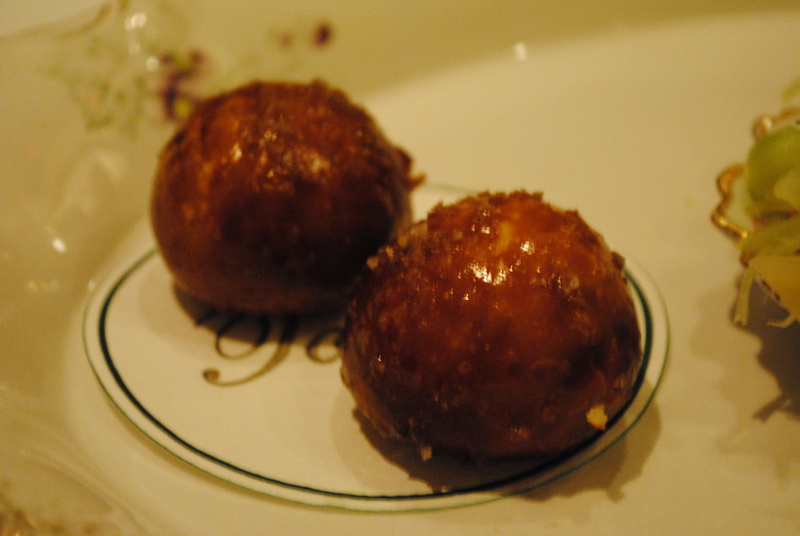 Torrisi offers up a 9 course set tasting menu for $100 and nothing more (unless you count the wine starting at $16 a glass — ouch) and nothing less. No substitutions allowed — you’re either willing to eat everything or don’t come at all — so harsh. I LOVE IT. 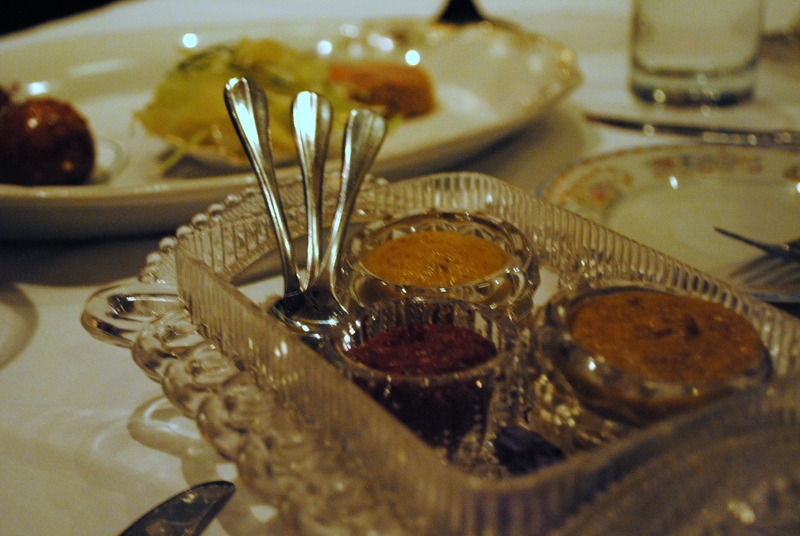 Now, this place is not just about eating dinner, it’s about having an experience. Similar to The Clove Club in London which I visited in September, Torrisi is about tantalizing the tastebuds and making you think (and eat) a little bit outside the box — the flavors, the presentation and the method are all carefully planned and executed, designed to give the diner a tour of the culinary arts, if you will. 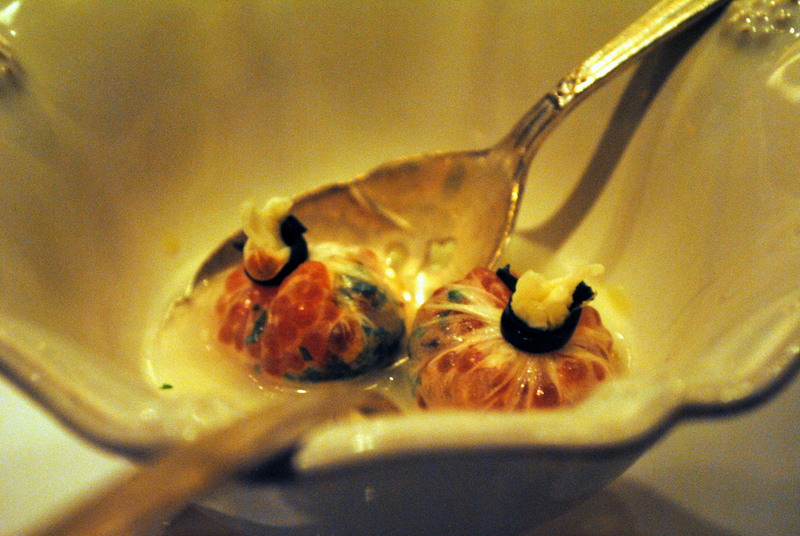 First there was a complimentary “beggar’s purse,” fresh mozzarella with trout roe tied with a chive string — a classic twist on the usual crêpe stuffed typically with caviar and crème fraiche. Squash macchiato with brown butter, bayleaf apple cider, mulled spices and Bailey’s started #1 of 9. 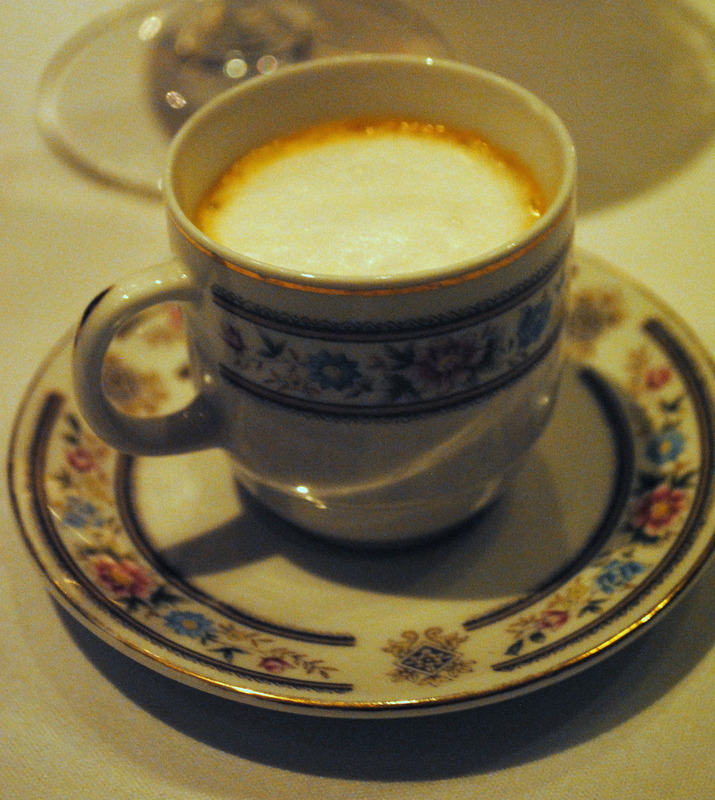 This does NOT, as I originally thought, actually have coffee in it — the macchiato portion of the title simply refers to the size of the cup. Upon reflection, squash combined with coffee does sound rather repulsive so I’ll be grateful. 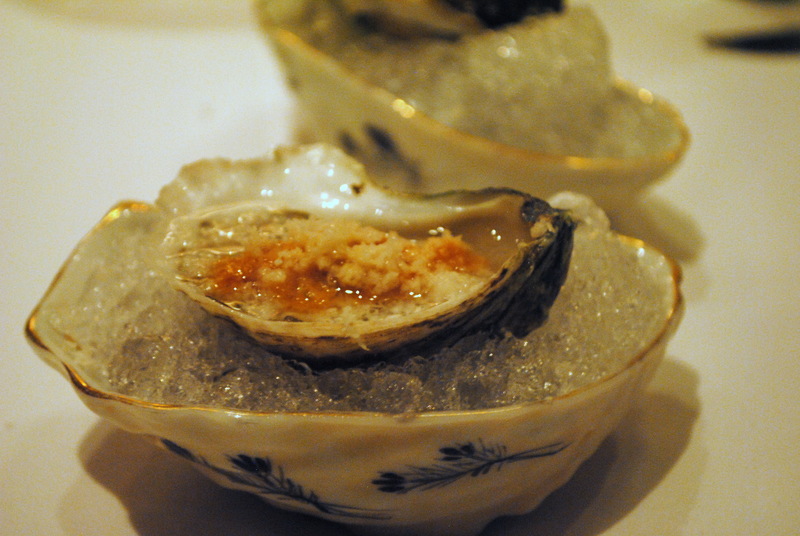 #2 of 9: Abalone and celery. 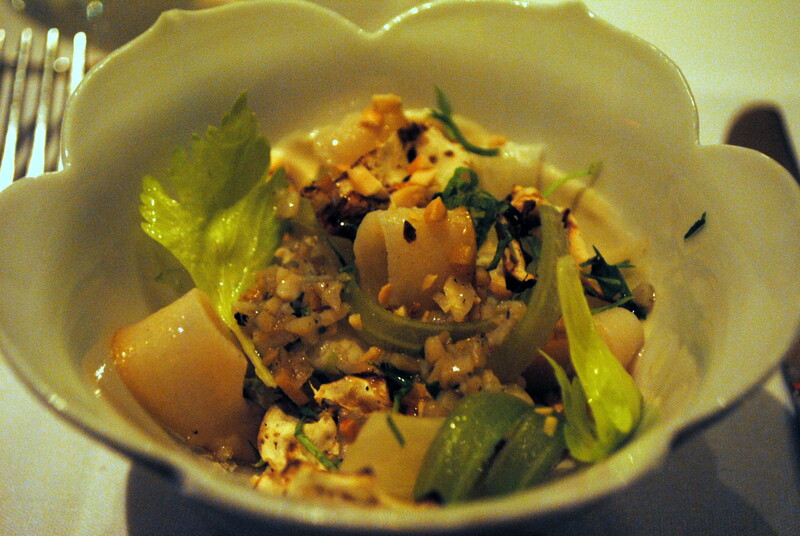 The meat (foot muscle) of the abalone, or sea snail, was served with pickled and charred celery, hazelnut purée and chopped hazelnuts. This was actually one of the highlights of the meal (I say actually, because I was quite surprised I enjoyed some celery and snails so much) — it was really refreshing and all the flavors complemented each other nicely. The abalone had a firm texture and a clean aftertaste, which kept me thinking about it long after I scraped the last bit from the bowl. Blue crab minestrone with tomatoes, green beans, bread crumbs, black beans and basil pistou. seemed to have left behind whatever was supposed to make it a minestrone — this was blatantly not a soup, not even a thick one at that. Liquid not present. 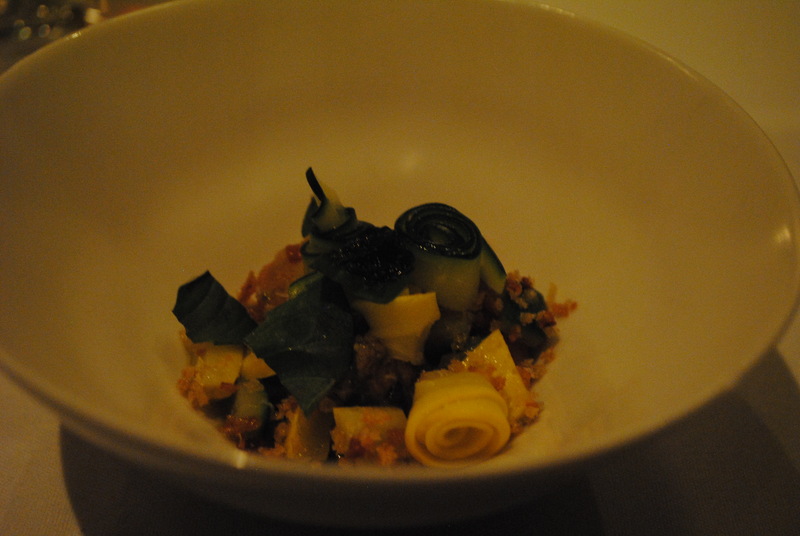 Other than, this dish was a bit meh. Compared to some of the other creations that were coming out of the kitchen, this paled in comparison. The mixed grill was comprised of many delicious little surprises including, and limited to, a trumpet royal/king mushroom “mille feuille” that was seared in foie gras butter and topped with sea salt flakes. Good texture but way too salty. 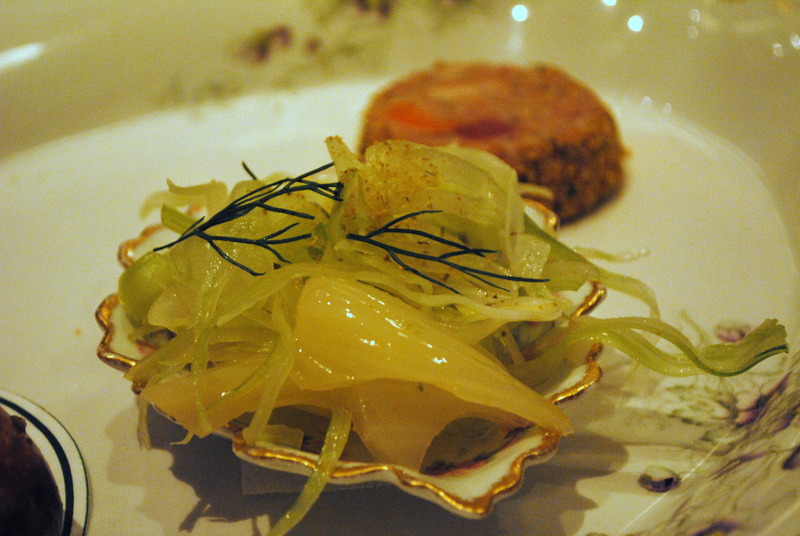 There was a veal terrine made with tongue, tail, sweetbreads and carrot sausage with pickled fennel salad and homemade pretzels baked over charcoal. There were three mustards to accompany the terrine and pretzels because you know, why not: Bavarian, nectarine, and cranberry. My personal favorite of the mixed grill trio was the oyster with a cherry reduction cocktail poured on top, sprinkled with freshly shaved horseradish – it was cold, fiery and delicious all at the same time. Next was the scallop marsala, a scallop with super thinly sliced matsutaki mushrooms in a marsala bouillon with sliced chives. It sat on a nice display of crushed shells for garnish. 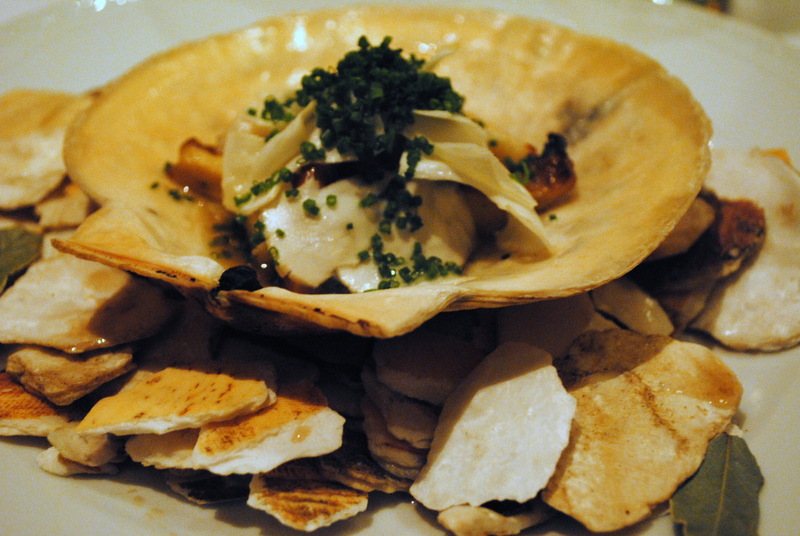 The scallop was decent but after that awesome oyster, no contest. Next (halfway through now! 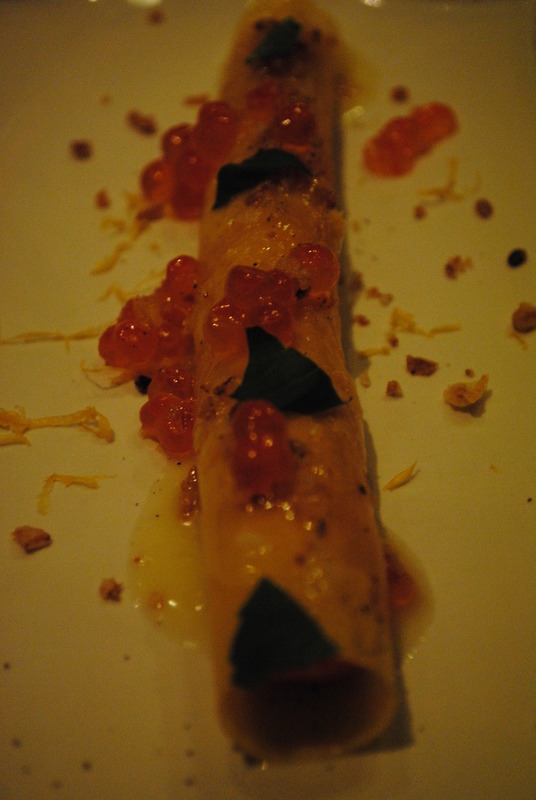 was the Scottish salmon tartare filled cannelloni with salmon roe, basil, and crispy shallots. Not sure if I’m onboard with the pasta/salmon combo but it was certainly different. 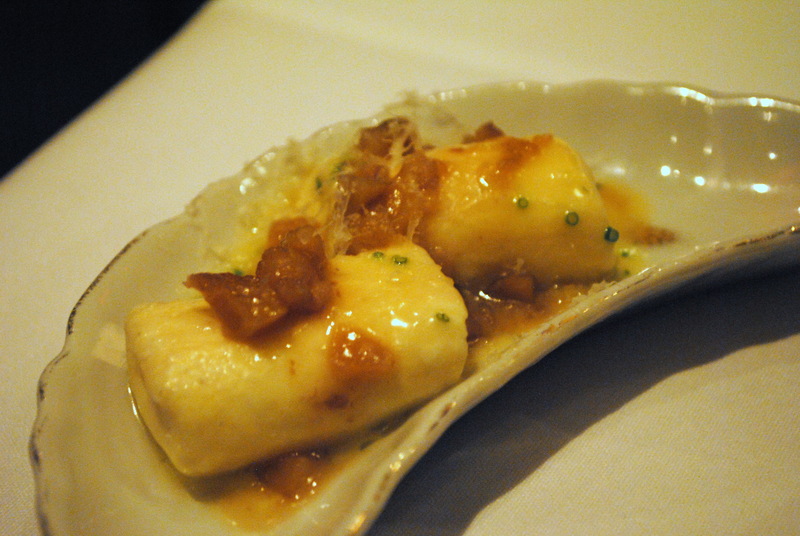 The sheep’s milk gnocchi – nothing to write home about, despite a lot of potential. Now the best part about the next course, the squab cacciatore, was not so much the squab although that was tasty (RIP baby pigeon), but rather the walnut dumpling that came with it. I, nor anybody I would imagine, regularly consumes walnut dumplings but I think we should all start. With the skin-on breast and the walnut dumpling and juniper berry and walnut sauce, this was the best meat dish of the evening. In fact, I was so greedy, I ate it before remembering to take a picture of it. At some point there was a ginger lemon ice palette cleanser that came in little white paper cups, the kind the ice cream shop gives you samples in when feeling generous. The beast doesn’t have a sweet tooth and therefore dessert is pretty much irrelevant. 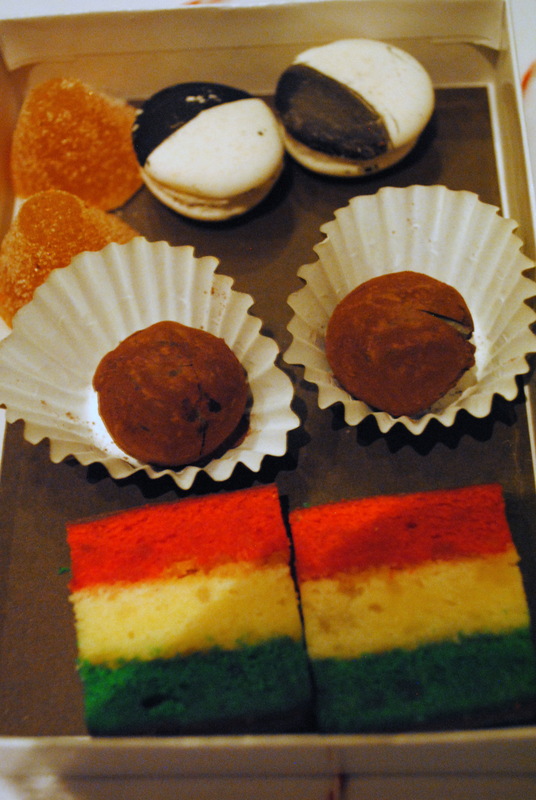 And it was definitely irrelevant at this meal because of the lackluster quality of the treats. 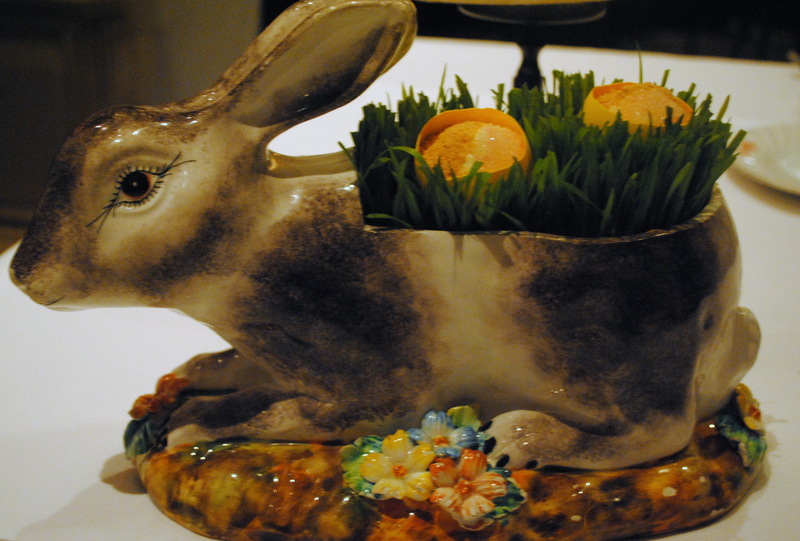 Despite the incredible weirdness of the cheesecake being served in eggshells inside of a porcelain rabbit looking like something they nicked out of my grandmother’s apartment, the cheesecake was way too lemony and the ricotta just did not work. 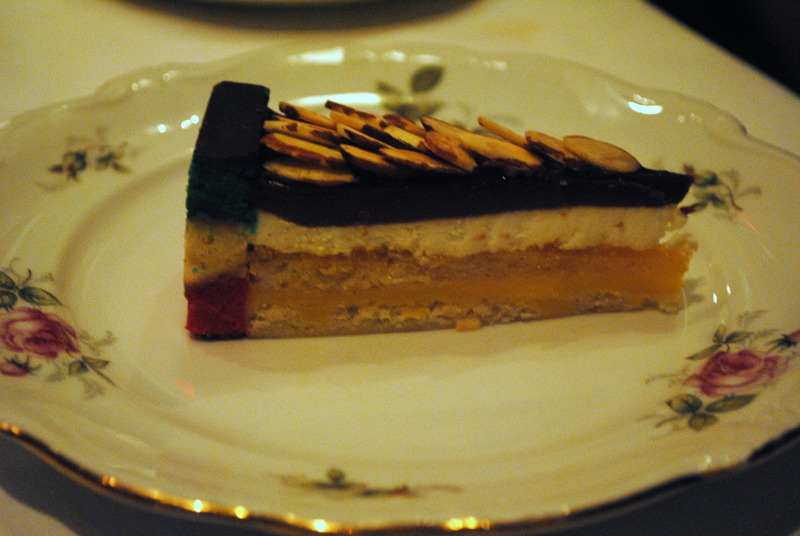 The rainbow cake was equally as uninspiring, extremely dry and crumbly, lacking any kind of moistness. All around disappointment. And then they send you home with a little box of sweets, cakes and cookies to make up for it. Aw. 9 courses for $100 may seem like a good deal, and I suppose it is for the amount of food you get and the skillful artistic preparation that goes into the whole damn thing but, those wine prices, will they kill you. After tax, tip and ONE glass of wine the bill per person was $150. So the $50 — which is half of the price of the set tasting menu mind you — is just on that one glass of wine and extraneous tip/tax charges. That’s not really a good deal actually. Despite the very limited seat count, the new restaurant will not be another tasting menu-only restaurant — it might serve a tasting menu, but it will also serve a la carte dishes. Definitely worth checking out to see if this is more value for the money. Posted in Restaurant Reviews - New YorkTagged beggar's purse, cacciatore, cozy, featured, fine dining, Italian, Italian-American, Jeff Zalaznick, Major Food Group, Mario Carbone, mixed grill, New York City, oyster, prix fixe, Rich Torrisi, squab, terrine, Torrisi, Torrisi Italian SpecialtiesBookmark the permalink.